We are now taking all clock (grandfather (longcases) a speciality) and barometer repair and restoration work. We repair and restore most types of antique clocks and barometers, mainly covering the counties of Gloucestershire, Herefordshire and Worcestershire and across the Cotswolds. 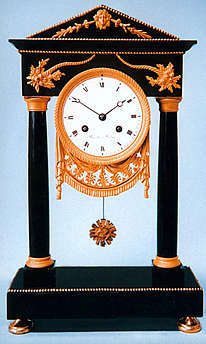 Jillings specialise in 18th and early 19th Century English and Continental antique clocks. Each clock , after being carefully chosen for it's style, originality and quality, is professionally and sympathetically restored. Regilded items are not accepted. All movements are original and carry our guarantee. We stock a large selection of french clocks including mantel clocks, table and cartel clocks made from various materials including ormolu, bronze , marble , enamel and tortoiseshell in various styles from the Georgian, Regency, Louis XVth, Louis XVIth, Directoire and Empire periods. We also have a good selection of affordable British longcase clocks ( Grandfather clocks), many of which are suitable for rooms with low ceilings. Good selection of antique barometers available.